This guy's name is Geronimo. As a West family favorite, he enjoyed his own private pasture and lived to be 22 years old. At his death in 1927 he weighed 2200 pounds and had a horn spread of 9 feet 6 inches. He is a fine example of a breed directly descendant from animals brought by Christopher Columbus from Spain to Santo Domingo in 1493 on his second voyage to the new world. That breed, which became known as the Texas Longhorn, was an important source of beef in the United States during the 1800's, prized for its tenacity in the temperature extremes and arid landscape of the American Southwest. 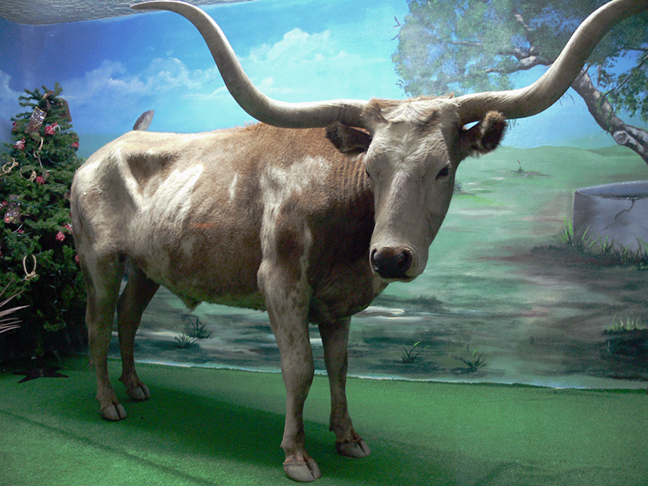 However, by the late 1920's Texas Longhorns had nearly disappeared from the range in favor of other breeds that were both easier to handle, by virtue of having shorter horns or no horns at all, and meatier. Today, Geronimo lives in a glass case outside the Live Oak County Courthouse in George West Texas. But on occasion he travels abroad. In 1776 he traveled to Moscow as part of the U. S. Bicentennial Celebration Exhibit.